I’ve recently been rereading the eight-book Anne of Green Gables series by L. M. Montgomery, for the fourth (fifth? sixth?) time. As always with Montgomery’s work, I love reading her fiction as informed by her journals (and her journals as informed by her fiction…it’s cyclical). I recently finished book six, Anne of Ingleside, and had…a LOT of thoughts. I reread Montgomery’s journals quite recently, and there was a lot that came to bear in this book. 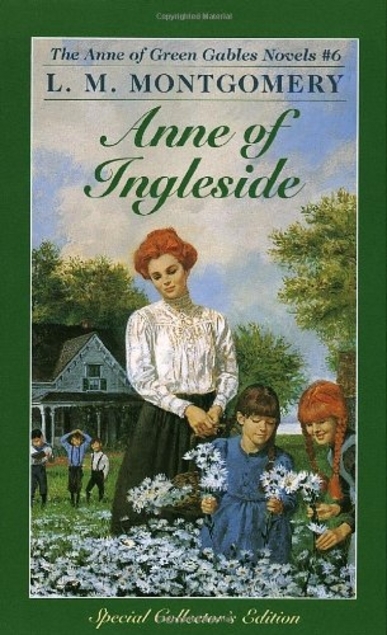 The last time I read Anne of Ingleside, it was my favorite of the series, though I couldn’t have told you why. On this read, I’m not sure it still is—but I know why it was. This changed significantly in the several years since I last visited it. Anne has grown up by now, and is the happy mistress of gracious Ingleside, with her successful doctor husband Gilbert, five children (number six on the way at the beginning), faithful maid (and surrogate co-parent) Susan Baker, and a respected place in society. The stories mostly revolve around Anne’s children, their little adventures and childhood heartbreaks. I realized for the first time in this reread that two completely different worldviews are at odds in this book. The setting and framework is optimistic and idyllic; the episodic stories are grim and disillusioned. Even though this is book six of eight, this is the very last novel Montgomery ever wrote, and her later journals show her deeply struggling with depression and dissatisfaction with aspects of her life. Anne of Ingleside is a war between Montgomery’s optimism and pessimism. The framework is the Blythe family, with their beautiful home and happy comradeship, living in a world rich with natural beauty. Most transitions between episodes describe the changing seasons and the beauty of nature (a major theme for Montgomery always). Ingleside is on several occasions compared favorably to less beautiful, less elegant homes (with some snobbishness, in fact). And the Blythe family is perfectly happy with each other—with the final story excepted (more on that later), any troubles come from the outside. From my reading of Montgomery’s journals, I think she created her idyllic family in the Blythes. Anne has grown into the warm, loving, endlessly patient and understanding maternal figure one usually finds in Montgomery books—I think she’s a combination of the mother Montgomery wished for (her own mother died when she was only two) and the mother she wanted to be. Gilbert is a heroic capable father who is usually absent, out saving someone’s life through his medical work (reflecting Montgomery’s largely absent but idealized father). Anne and the Blythe children all reflect Montgomery’s love of nature and possess a rich dream life. By giving these qualities to all of them, Montgomery also gave them an understanding community of like-minded family members, which she herself lacked. When I last read this book, I considered it the one I’d most like to live in. That was a reflection of the framework I just described. On this read, I paid more attention to the nature of the actual stories, and that’s where the darker side of Montgomery’s life comes in. Story after story involves sorrow or disillusionment, nearly always from an outside source. In multiple stories Blythe children meet a false friend who betrays them. Jem goes through multiple dogs that bring sorrow—one dies, one can’t stop loving his previous master. A visiting relative makes life miserable for a long stretch. Cherished childhood dreams turn to dross. Gossip about the outside community references darker themes, including an extended aside about an abusive man whose first wife’s sister stands up to denounce him at his funeral—and his second wife thanks her. The plots are about lies, betrayal, cruelty, disappointment and disillusionment. It’s a grim chronicle—almost! The saving grace that keeps this a remarkably light book is the end of every story. Every disillusioned Blythe child turns to loving Mother to console and comfort and keep hope alive. The disagreeable relative eventually is forced out without a need for the Blythes to betray their code of kindness (a kind act mistook actually sends her away). Disagreeable outside families are always contrasted to the loving Blythes, who never take on those darker qualities. Somehow, hope always wins. The stories are dark, but they never shake the positive foundations. Nature continues to be beautiful, and each Blythe continues to be wrapped in the warm love of their family. This conflict between hope and disillusionment is most apparent in the final story, a rare one that focuses attention on Anne herself. I’ve seen it asserted in essays that the ending of Anne of Ingleside is too easy, simplistic, and convenient, that it lacks any complexity or depth for the sake of a happy ending. And taken purely by itself—yes, that’s probably true. However—put in the context of Montgomery’s life, I’d argue it’s richly meaningful. After living throughout the book the life Montgomery wants, in the final story Anne is threatened by the life Montgomery lives. Suddenly, without any prior lead-up or hints, Anne feels tired, worn-out, trapped by her daily work. She turns sharp and impatient with her children. Most significantly, she fears Gilbert has ceased to love her. He grows absent and distracted. When an old girlfriend pays a visit, Anne worries that Gilbert harbors a secret love for her. On the surface, a contrived-enough problem. But compare it to Montgomery’s life, especially in the final years when this book was written. Anne’s narrative description of feeling “all the time like a creature in a nightmare, trying to overtake someone with fettered feet” sounds very unlike carefree Anne, but might have been lifted directly from Montgomery’s journal about her own feelings. And Montgomery’s husband Ewan (at least by the evidence of Montgomery’s journals) did grow absent and unaffectionate for years, obsessed not with an old love but with “religious melancholia,” the conviction he was among the damned (probably modern science would diagnose depression, with side effects from medications, according to Mary Rubio’s brilliant The Gift of Wings). Montgomery frequently wrote of her distress that Ewan never noticed her own exhaustion or worries—the exact complaint Anne makes of Gilbert. And that neat ending I mentioned? Gilbert turns out to have been distracted by a delicate medical case. When he learns the patient will live, all difficulties are swept away. At once he is loving and attentive again, concerned for Anne’s apparent exhaustion, and all her cares disappear, leaving her happy and satisfied once more. Convenient? Sure. But it was the fulfillment of Montgomery’s wish for her own life. Ewan’s malady was marked by the odd good day or period when he seemed cheerful and healthy again, keeping Montgomery always wishing this might be the end of the nightmare at last (it never was). Here in her final book, Montgomery gives Anne the ending she wanted herself, for all the nagging worries and dissatisfactions to be swept away and life to become the beautiful thing she believed it could be. Anne feels young again; Montgomery in her later years frequently wrote of especially good days or moments as restoring her to youth. It’s a simple ending as a narrative, but on a meta-level it speaks to Montgomery’s hope and optimism that never quite were lost. Of course her publishers wouldn’t want her to end the story with Anne depressed and unloved—but this feels too personal to be purely a business decision. I think Montgomery wrote her deepest wish into life in this ending. Taken as a whole, the book tells us something profound about Montgomery’s life and views. She frequently felt sad and disillusioned—but, at least by the writing of this novel, she hadn’t quite lost hope that something more beautiful was possible. I’m not sure anymore that this is my favorite of the series. But it was thought-provoking! One always needs hope to keep going, and Montgomery was no exception to that. She was able to beautifully articulate it in her stories.